Somehow, despite being located in America, Alder and Chef Wylie Dufresne have never had a burger on offer. But that has all changed. Chef Dufresne is now doling out the first burger he's ever offered, and in limited quantities. The $13 burgs will be available nightly -- Sundays through Thursdays -- from 6pm until they're sold out. And although it might not be as crazy as some of the gastronomic concoctions he's served at the now-closed wd~50 (deep-fried mayonnaise cubes, cold fried chicken w/ hot sauce and caviar, etc. 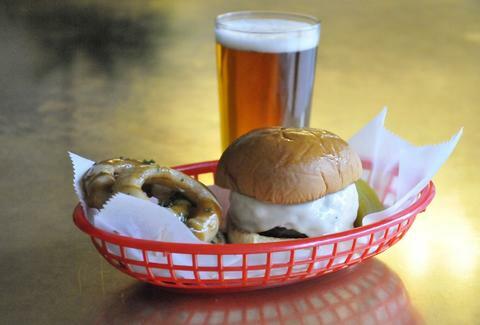 ), it's still no ordinary burger. It features a combo of La Frieda chuck and brisket with shio kombu ground into the mix, and to kick it up in a very Dufresne way, the kombu is cooked in sake and tamari to give the burger an added element of umami. It's all served up on a Martin's potato roll, topped off with house-made beer cheese crafted with Greenport Harbor Brewing Harbor Ale, and it comes with spears of half-sours from The Pickle Guys. And if you really want to get the most out of your Dufresne burger experience (you do), go with the All-In Burger option for $21, which gets you the burger, half an order of French Onion Soup Rings, and a glass of Harbor Ale. You'd best show up early, because remember: LIMITED QUANTITIES! Pete Dombrosky is an Editorial Assistant at Thrillist and he has to go... check on something... in the East Village. See how he fares on Twitter.